liana Martinez assembles a beginning drawing kit. She is the main kit builder in our Reno distribution center, and also works to pick everyday orders. In my time as a buyer and retail manager, before I came to MacPherson’s, a dedicated member of our retail team actively worked on building and maintaining kit business for at least five months out of every year. From reaching out to teachers and following-up, and following-up…and following-up, to picking brands and price points for professors unfamiliar with the options available, to ordering and finding appropriate replacement items, to assembling, spot checking and labeling kits, to distributing them to students and their parents unfamiliar with the uses or costs of materials…it’s tough work. With every kit success comes many (many) failed attempts at cultivating that business. Based on my experience, I have compiled a list of best practices for building and maintaining your kit business. First, remember that you are a valuable resource. Your staff is knowledgeable, you have access to a breadth of materials, a familiarity with the pros and cons of different brands and a store full of inspiration and opportunity. Approach your conversations with confidence: you are an expert who can provide a professor’s students with the tools for success, not just for a semester but for their entire college careers, and after graduation as well. You’ve given yourself a pep talk, identified a target and you are ready to dive in. Now what? In the store. If a professor is in store, have a generic completed kit handy by the register that you can pull out and show off, or have displayed behind the register. Gauge their interest and follow up right away, when their interest is piqued. Reach out to every professor you can on an infrequent but consistent basis. A simple message or “friendly hello” explaining that you’d like to help them ensure their students have what they need in class can mean success down the road. Be sure to avoid busy academic times like midterms or finals while communicating. On their turf. Connect with the art department chair and ask to attend an upcoming staff meeting to introduce yourself. Bring samples, goodie bags, your business card and recent sales flyer. Send a heartfelt thank you note for the invitation and follow up on a consistent yet appropriate basis. If you are unable to make a connection, consider a mailing to each professor’s physical inbox. Be careful to avoid spamming email inboxes, as a lot of university e-mail systems have a spam block in place, you can blacklist yourself without even realizing it. Tip: Share our kit flyer with your professors! Don’t be discouraged: Some universities have established connections and required resources to get their students supplies—this information is a gift. You can put your energy elsewhere. Create your own opportunity. A professor who has never heard of your store has no reason to entrust their students to you. Consider hosting an in-store “teacher appreciation event” with goodie bags, try-it stations of the most common kit items, and even wine. Attend school fairs and create a “class-list database” in store by requesting course materials lists from local schools. Collecting class lists prior to the semester is not only a great way to ensure you are properly stocked, it will add value to students shopping with you for the first time; you already know what they need, and this knowledge allows you to provide an exact kit quote to that professor for an upcoming semester. Curious about the most common kit items? We’ve compiled the top kit items coming out of our DCs on this list. Authentic and personalized. It is very easy to identify mass-emails—which can be a turn-off. Be sure to personalize your communications, do your homework; check for course lists and materials lists on the school’s website, remember what materials they’ve used in previous semesters or send them a “new product” list relevant to their classes. Foster a sense of community throughout the year by going to, or sending your staff to, student and professor art shows at your local universities—artists supporting artists! Short, sweet and to the point: make the process as easy as possible. In my experience art professors hate their email. They neglect it and sometimes ignore it completely. Providing a two- or three-step solution from expressing interest, in person or online, to ordering a kit will make everyone’s lives easier. If the professor knows what courses they are teaching, tell them “All we need is your course materials list, and we’ll get back to you with a quote.” If they don’t yet have their courses set or their materials list, provide them with a generic Drawing, Painting, Sculpture, etc kit worksheet—digital or hard copy—and ask them to indicate brands or items they’d like to add or remove. Send a quote with suggested replacement items to either drive up the quality or drive down the cost. Because this conversation is often COST motivated, keep your willingness to support their students’ financial needs at the forefront of this conversation. Confirm the date that materials are needed by, the number of students, and provide the professor with a handout that directs their students to your store with a clearly labeled materials list complete with pricing and total cost. Tip: When ordering your kits, allow yourself a week long window before classes begin to account for any last minute changes from your professor or an adjunct suddenly assigned to this course. Timely. In today’s world of instant gratification, it is inappropriate to have more than 24 hours go by without a response to an inquiry. Always return a quote within 24 hours of receiving a list; no exceptions. Same goes for delivering kits. Stay in communication with the professor or department chair on any and all delays. If you have a smaller staff, consider assigning a senior staff member this task as a priority before the BTS season begins. It is easy to get a quote of your cost and kit MSRP through the Kit Center on MacPhersonArt.com. If you have questions on using this tool, reach out to your account manager. Be cost friendly. Consider adding a blanket discount to all kit items—even 30-40% off MSRP. You may not turn a huge profit on all items in the kit, but gaining the business and getting students in your store should be a goal. There is always the opportunity for impulse buys or add-on items along with the kit purchase. Expand your community. Be sure to include any relevant marketing material, upcoming sales or classes, a coupon, or a freebie into your kits—you’re creating a customer for possibly years to come, so start off on the right foot. Questions? 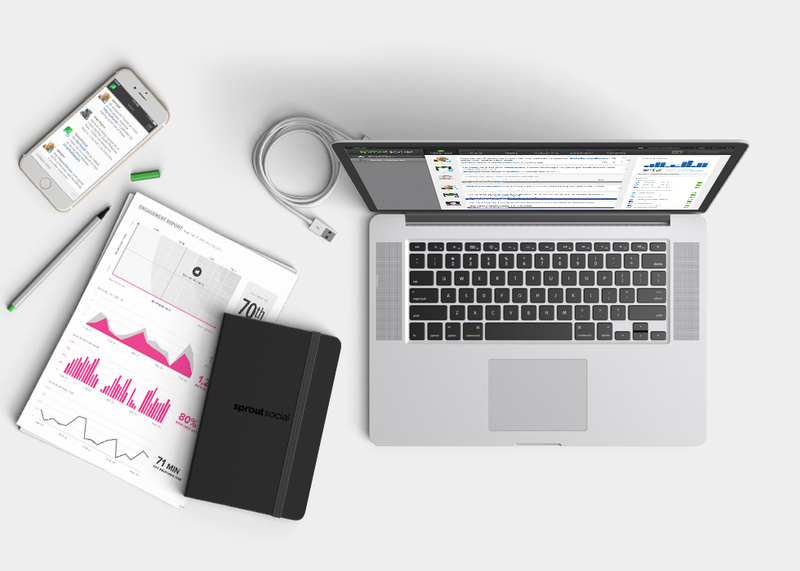 Reach out to your account manager, and we’ll be happy to help you come up with a gameplan. Speedball is pleased to announce that Ben Lapin has been promoted to President of Speedball Art Products Company. Ben started with Speedball in 1997 as Chief Financial Officer and handled all financial matters during the start-up years. He later took on responsibility for Sales, Marketing, and Customer Service and proved that he was much more than a bean counter. In October 2006, Ben became Chief Operating Officer responsible for all day-to-day activities of Speedball. In the past 12 years Ben has led the integration of several acquisitions while strengthening Speedball’s core business. “Good is never good enough” with Ben; he pushes himself and all of Speedball to achieve the very best. Everyone at Speedball looks forward to seeing the results of Ben’s energy and passion in his new role. Venerable Vintages is a chance to indulge in the art supply nerd in all of us. To submit a special item connect with us at artdogblog (@) macphersonart.com. This month’s Venerable Vintages is a collection of drawing instrument ephemera from MacPherson’s Emeryville office. The collection features a compass set beside various patented compass, divider and ruling pen designs from an Alteneder & Son’s pricing booklet published in 1871. The compass has a long interdisciplinary history, with science and art at the heart of its purpose. A tool for mathematics, architecture, engineering, geography and the arts, the compass (or “divider”) dates back to ancient civilizations3. We investigated how the compass came to be, who it was invented for and who uses it now. 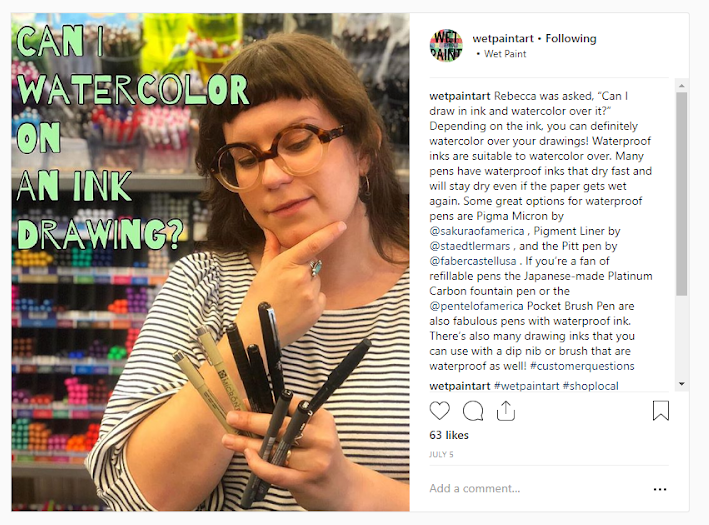 Art supply nerds, read on. Though the terms compass and divider are often used interchangeably, there is a difference. A compass is a hinged drafting instrument with two ends, one that comes to a point for positioning on a surface and the other that clasps onto a pencil, lead or piece of chalk to draw a precise circle or arc. A divider has two sharp points and is designed to measure distance or to score a circle/arc into a surface with one of the points2. It’s likely that the compass—or a tool similar to it—was utilized by many ancient cultures; the earliest proof we have, however, is from Roman and Greek ruins2, 5.Throughout history inventors have claimed ownership of the tool; it has been through so many iterations that the notion of one sole inventor is less interesting than the capabilities of the tool itself. It has evolved over time, perfected and customized by the needs of artists and inventors like Galileo, Da Vinci and Durer. Their improvement included a knuckle-joint hinge which made the tool easier to use, and the adjustable proportional divider with a screw adjustment for large radii. Da Vinci’s additions also resulted in the concept of the interchangeable point—the clamp that allows for various media to be used to draw (graphite, chalk, etc.)2. During the second half of the 16th century, Galileo designed a tool for use in mathematical instruction in 1597 that resembles an early version of the bow compass. His iterations allowed users to do an array of things, from calculating interest, expressing square roots, calculating areas of volumes, surveying a territory, measuring gauges and architectural layouts4. The importance of customization, specialization and innovation when it comes to designing art supplies is not news to our community; neither is the knowledge that often the best innovators and inventors are the artists themselves. The compass, over two thousand years old, is an excellent example of how a traditional tool needs constant reworking and innovation to remain relevant. While this drawing instrument has been used for thousands of years and has been manufactured by many companies throughout Europe in the 19th century, the shadow box hanging in our Emeryville office pays homage to the contributions of Theodore Alteneder, another maker who sought to improve the drawing compass. An American machinist, draftsman and owner of Alteneder and Son’s in Philadelphia, Alteneder was the only manufacturer of drawing instruments in the states at the turn of the 20th century1, 6. He patented a new joint design in 1850, “…which made [the joint] dust-proof and free from wear and friction”1. This design became known as the “American pattern” of the instrument. For some, CAD programs and other graphic design tools have made the drawing compass obsolete. But there is no denying that for geometry students, draftspeople and designers with illustration backgrounds, the compass is still a crucial tool. Anyone putting pen to paper and in need of precise measurements and accurate scaling will need to keep a physical, real-life drawing compass on hand. As we delved into the nuts and bolts of drawing compasses we discovered a jazzy homage to old school drafting techniques. While this video doesn’t actually feature a compass, if you are more of a paper and pencil person, take a break from tech, relax and unwind to this tribute to the precise, mesmerizing discipline of drafting! Interested in or passionate about the history of an art supply? Have a collectible item you’d like to share with us? Email us at artdogblog (@) macphersonart.com. Bud, R. and Warner, D. “Instruments of Science.” London: Science Museum, 1998. https://books.google.com/books? Accessed November 5, 2018. “Dividers & Compasses.” National Museum of American History, 2008, americanhistory.si.edu/collections/object-groups/dividers-compasses. Accessed November 5, 2018. “Galileo’s Compass—History of an Invention.” Istituto e Museo de Storia delle Scienza. https://brunelleschi.imss.fi Accessed November 8, 2018. Hartenberg, Richard S. Joseph A. McGeough.”Hand Tool.” Encyclopædia Britannica, December 2015. https://www.britannica.com. Accessed November 5, 2018. Railway Locomotives and Cars, Volume 73 Simmons-Boardman Publishing Corporation, 1899. P. 405. https://books.google.com Accessed November 8, 2018. The classic question this time of year: “My cousin/sister-in-law/friend/neighbor is an artist, what should I get them?” Gifters may not be familiar with the supplies and mediums their giftee prefers; providing an endcap or featured table in the form of a “Gift Guide” helps point customers in the right direction—without needing a staff member to walk them through the entire world of art supplies in three minutes. In an effort to encourage and inspire, we’ve created a selection of products for five creative personalities your customers might be shopping for: The Dedicated Artist, The DIY Crafter, The Young Creative, The Organizer and The Traveler. Peruse these profiles and consider putting together an end table or countertop display to spotlight the best products for each archetype. The first personality to come to mind is the most difficult to shop for—the dedicated artist who knows what they like, has a studio, and has been creating for some time. If you offer classes and workshops, let customers know that they can gift someone a class. First, make sure your class titles are as engaging as possible—click here for some helpful titling tips inspired by Artisan Expo. Offer a “class in a box” with a festively designed schedule of upcoming classes and a helpful note pointing out where the gift-receiver can find more classes online. Wrap it in a paper mache box tied with ribbon for extra effect. Gift cards are another valuable gift that will drive traffic to your store—keep them on display to remind customers they don’t have to do all the legwork. If you’re able, offer to gift-wrap the card in a creative way like in a handmade envelope or small box with tissue—these small gestures matter. A pen and nib case, or other ArtBin products. Oils: Gamblin Oils Intro, new Rives Gauche sets from Sennelier, or the beautifully packaged Loving Vincent oil set. Colored Paper—why not roll it with some like toned decorative papers, tie them with a ribbon, and sell as a “card making cache” at a special price? Stillman and Birn Sketchbook like the new trio! Pen and sketching sets from AA, Masterpiece, Speedball. If you don’t have the space for a display or designated endcap, create signage guiding your customer through each personality. For instance, “I am an acrylic painter, I like textured surfaces, painting knives and different kinds of expressive brushes,” “As an artist with a studio, I probably already have <insert item of your choice>, but would be excited by a new or a gift card!” Have your staff members share their mediums and provide a “wishlist” that your customers can use as a guide. Get creative! 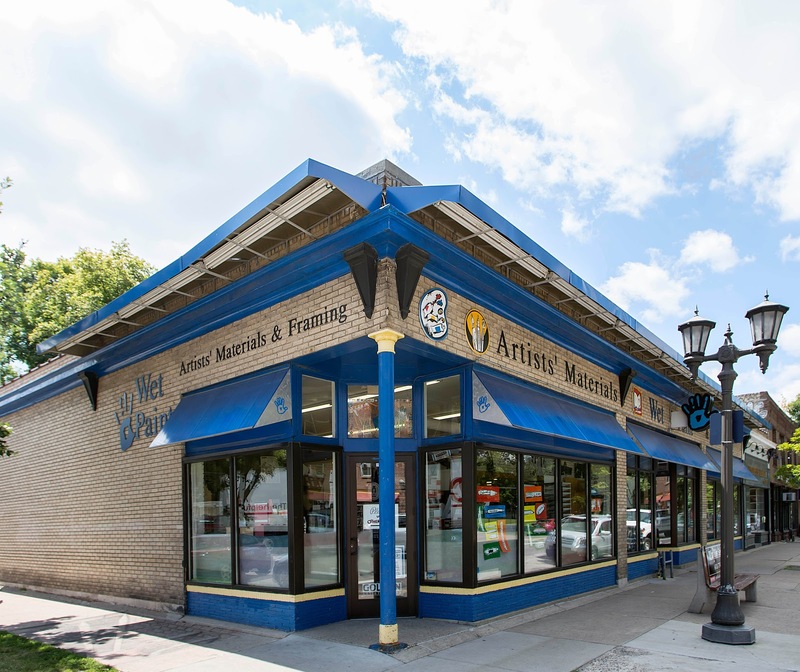 Riley Street Art Supply has locations in San Rafael and Santa Rosa, CA; this month they celebrated 50 years of being in business, with the San Rafael store turning 11 this past June. Both stores celebrated with a two day sale where everything was at least 30% off, and the San Rafael store partnered with vendors to set up outdoor booths with various Make-and-Take activities and demonstrations. Vendor partners included Daniel Smith, Golden, Strathmore, Jacquard, Savoir-Faire, Liquitex and Marabu. The event was a great opportunity to engage with repeat customers as well as passersby who had never even been in the store. The interactive outdoor booths were more than an anniversary celebration; strategically timed with weekend window shoppers and tourist foot traffic, the booths drew first-timers in and the hands-on activities generated sales opportunities. Strathmore did a “Splash” greeting card Make-n-Take with FW inks and Art Alternatives artist tape on their mixed media greeting cards. Jacquard presented Piñata alcohol inks on YUPO paper so that passersby could design their own bookmarks. Daniel Smith attracted watercolor enthusiasts with their watercolor dot cards, while Faber Castell had artist Don Colley running a demo on urban sketching with Pitt Artist Pens. Pentel brought the Brush pens, Sign Pens with brush tips as well as their water brushes to demo lettering and urban sketching techniques. Savoir-Faire had Andrew Cook demoing Abstract Acrylics. MacPherson’s Account Manager Catherine Thoele worked two booths over the course of the two day event; Derwent, where she demoed Coloursoft and Metallic pencils on Art Alternatives wood panels, and POSCA, where she showed participants how to create a customized surfboard necklace. Later that day they returned with the girl’s two friends; the three of them got to work and 45 minutes later, their friend’s skateboard was transformed into a beautiful work of art. Afterwards they visited the store with their parents and bought over $100 worth of markers. We’ve outlined everything you need to recreate Catherine’s POSCA demo. Drill a 1/8″ hole in the top of the surfboards before event. Pre-spray one side with Montana GOLD over a Crafters Workshop stencil so that participants focus on one side—this makes the craft more doable and limits time to keep traffic moving. Set out a sample surface so that people can test out different colors and nibs; demonstrate how to blend on a non-porous surface, like Yupo. Once they are finished, cut Hemptique hemp cord to desired length, thread through hole and double knot it. Spray the finished surfboard with workable fixative so the customer could add more media if they wished, she recommended finishing the boards with a clear coat spray. Get permission and snap a picture of the artist wearing the finished piece for future promotion and to share on social media! Like most of us in the art supply business, John Kittle wears many hats. He is the owner, manager, lead art teacher, and lead framer at Kittles Art Supply in Show Low, Arizona, nestled in the White Mountains in a tightly knit rural community. Like many mom and pop shops, moms, pops and other family members help the business survive and thrive. 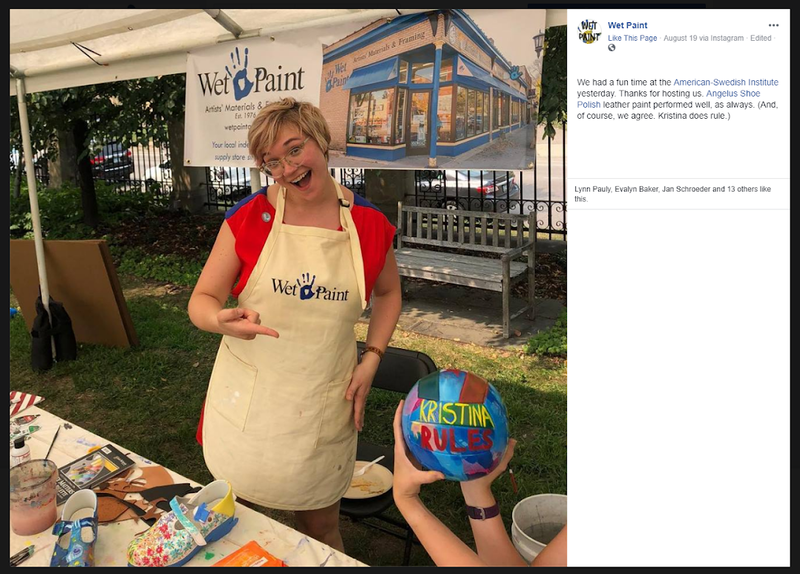 Running a business in a sparsely populated area presents its own set of challenges; John points out his three core business strategies: selling art supplies, offering classes (including a summer camp) and running a custom frame shop. Catering to a small community means seizing every opportunity– and creating your own opportunities. Here is where the Art Bar comes in. MacPherson’s Account Manager Kim Cichy clued us in to an innovative try-table that John designed, built and recently installed in the shop. The experience table—or Art Bar—acts as a bridge; an overlap between the customers who frequent classes and those who spend more time in the store, a connection between the products on the shelves and the experience of creating art in your own home. The station has also increased foot traffic and positively impacted sales. John, who is an artist and designer in his own right, designed the Art Bar on his computer with a CAD program and then collaborated with a “builder-friend,” bringing the concept to life. The bar has been designed with both the customers’ and the staff’s needs in mind. For staff, it hasa repository for replacing the product, and items can’t fall off of it and make necessary mess. Angled like a drafting table for a comfortable drawing or painting position with a catchment to prevent pens, bushes or markers from rolling away, the bar has cubbies below that stock a wide variety of surfaces for customers to select from. The flat surface at the top of the bar features holes that house various containers of brushes, markers, gel pens and more. Staff members become Art Bar-istas of sorts—they tidy the bar, notice what works and what doesn’t. The incorporation of a Buddha Board was key. The board reacts to water, allowing customers to experiment with different brushes allowing them the opportunity to make an informed decision on their purchase. Testing brushes and experiencing synthetic vs. natural hair, different shapes, and handle lengths- with no messy clean up, paint stains or dirty tools makes the buying experience fun and educational. As customers use items at the Art Bar staff maintain the supplies and switch out materials as needed. The little shelves underneath with extra materials serve as a repository for staff to pull from. If the Art Bar inspires someone to ask to try a specific product that isn’t there, John pulls the item from the shelf, no problem. This “go for it” attitude results in positive experiences and translates to sales. While the crafty retirees are in and out almost daily, the Art Bar is just as popular with teens. On Fridays in their community, schools are either a half day or not in session at all. John has used this as an opportunity to host after-school art classes; after class is over, the “adolescent types” congregate around the table to continue creating and socializing. The low-stakes concept of an experience station invites people to relax and get to know products outside of a structured class environment and without the pressure or confusion of standing in an aisle trying to make a decision. The key motivation for creating the Art Bar was allowing customers to explore different surfaces including mixed media paper, Ampersand boards and various sketchbooks. As you can see by the menu, it has turned into much more. In September, Account Manager Mia Fesmire and Brand Marketing Manager Ariana Faustini represented MacPherson’s exclusive brands at a three-day art supply extravaganza in Santa Fe known as Artisan Expo. The bi-yearly consumer show is sponsored by Artisan Santa Fe, a retailer with locations in both Santa Fe and Albuquerque. Artisan Santa Fe founded Artisan Expo in 2000, and the event has grown over the years to become the largest art materials and instructional event in the world! They host over 100 half-day and full-day workshops led by expert instructors, as well as a vendor trade show where over 80 vendors cater to artists who travel from all over the country, eager to learn and ready to restock their studios. We wanted to share a few takeaways with our community, because we believe the Artisan Expo model is a profitable sales strategy for retailers when replicated on a small scale. The MacPherson’s booth, fully stocked with Art Alternatives surfaces, MABEF easels, Derwent Inktense sets and POSCA markers on day one, ready to go. Our experience: this year Artisan Expo saw record-breaking attendance with participation up 25%. 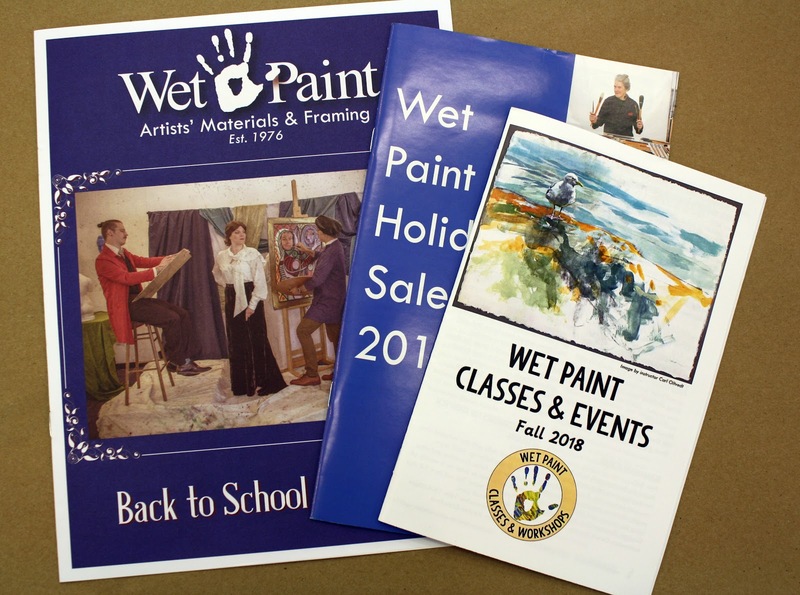 We provided instructors with Art Alternatives canvases as well as assorted RGM palette knives to promote the product and encourage attendees to visit our booth to get the same products they use in their workshops. In addition to the samples, we brought Art Alternatives wood panels and canvases, MABEF easels, POSCA markers and Derwent Inktense sets. Artisan Expo attracts creatives who have the resources to invest in their craft, either by enrolling in a workshop or by taking home higher end supplies. How do they do this? The answer can be broken down into three parts: 1) a thoughtfully put together long-form workshop, 2) taught by an expert 3) in conjunction with a targeted sale. There is a reason that college-level fine art courses are three hours, sometimes five. Art takes time. While quick demos or make and takes are strategies that work for some customers, people with artistic talent who are hungry to learn will revel in the extra time that a three or six hour workshop affords. This extended time helps artists gain confidence with a new technique, making them more likely to purchase the materials needed to continue practicing. They will leave rejuvenated and focused, inspired by the expert staff or instructor who spearheads the class. 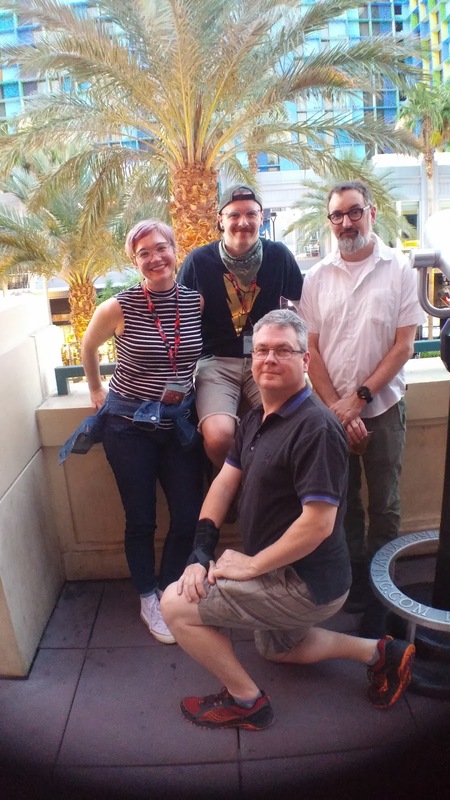 Some retailers are already taking this approach: this summer we covered an example of a successful two-day event at Dots and Doodles, with support from Royal Talens, which led with a movie screening of Loving Vincent followed by a painting workshop the next day. If you have the space and time to host an afternoon or full day workshop and have a community of artists to tap into, it is well worth the investment. Aside from the length of the workshop, the title (and of course, the content) is worth focusing on. Artisan Expo hosts workshops on book making, sumi ink, watercolor, encaustics, jewelry making, gilding and more. Choosing a topic, technique or material and titling it in an inventive way draws in a specific crowd that wants exactly what they are serving up. When glancing at the title, customers imagine what they might create and get inspired to take the next step: enroll! Great titles often include strong verbs. What will they be doing? Inventing, capturing, traveling, thinking. The title also specifies a medium in conjunction with a style (incorporating photographs, broadening aesthetic style, Zentangle, plein air painting on the go). The site-specific class attracts people with an attachment to your community’s landscape or cityscape. This specificity is key. Spending the day (and the price of tuition) on “Acrylic Painting 101” is not very motivating; try “Light Up Your World with Acrylic Painting on Dura-Lar Film.” By being more specific, you reach more people. You are highlighting a technique and connecting it to a visual (lighting up your world) or another medium (watercolor). Reaching the attendees who are actually interested in what specifically the class is focused on, you’re (probably) more likely to turn those artists into avowed fans of your events. Many of us know from experience that a good teacher can propel us forward in directions we never thought possible. The instructors—whether they are expert artists on your staff or outside hires—will make or break this experience. Workshops are a great opportunity to pair expert artists with relevant product, and to work with vendors to feature specific items. Make sure the instructor is well-acquainted with the product you are spotlighting- they are advertising the expertise your customers should expect from you. Fine artists and enthusiasts love to get technical, and seeing why a specific product works best for a nuanced technique will keep them interested and engaged. When class is over and students are on their way out the door, they discover those very products they were working with in class are on sale! Offering a sale of specific items in conjunction with the workshop is the finishing touch that seals the deal. Once someone has already invested in a high quality half-day or full-day workshop, throwing in a handful of art supplies or an easel that will allow them to recreate the experience at home and practice techniques they are committed to will be a no brainer. Ensure you are well-stocked in any products used for the class, and have the instructor/staff member offer to walk students through your store/booth to answer any additional questions they may have. If you don’t have the resources or space for a workshop, having a “Try-Table” or a “Make It Take It” station is a great way to engage with artists. While the paper pads on various displays are useful for seeing what a marker or pencil looks like on paper, providing chairs and a full size surface allows people to get comfortable and really dig in. We reached out to John Kittles of Kittles Art Supply in Arizona to learn more about their successes with their custom-designed Art Bar. Click here to read the feature and discover how you might set one up in your store. *Pro tip: If you organize a “Make It Take It,” include instructions as a part of the takeaway, and add hashtags and encourage people to share their work using on social media, using the hashtags. It goes a long way to expand your reach! If MacPherson’s has a favorite holiday, it may or may not be the one that involves dressing up, decorating, turning the world upside down and tapping into our imaginative, artsy sides. While delivering creativity is what we do on the clock, we embrace (and express) creativity outside of work too—in fact, for many of us it is the fuel that keeps us going! Halloween is a chance for us to show off this creative spark. We kicked off the day of Halloween with a costume contest. Jeanine Davids as The Butcher, Ariana Faustini as an American Eagle and Christine Sanchez as Billy the Puppet from Saw. Georgina Aguirre as Spider-girl, Luz Semidey as Jack Skellington. In the weeks leading up to Halloween, various departments in Emeryville strategize, brainstorm and percolate: how can we transform our everyday desk pods into creatively creepy Halloween-themed menageries? Creative Services and Brand Marketing and Category Management had their eyes on the prize. Creative & Brand built a giant spider’s lair, complete with a witchy conjuring table and a graveyard — but their efforts were no match for the veteran Halloween champions in Category Management. They transformed their area into a haunted house, complete with lights, music and maniacal characters! While it’s hard to capture the experience in words, here’s what it was like to walk through their creative, terrifying house of horror! For scale: Creative Services & Brand Marketing’s spidery lair tucked above the (first prize winners) huge haunted house by Category Management. Congrats to Category Management for a well-deserved win! The amount of teamwork, collaboration and imagination that went into the haunted house is inspiring. The haunted house experience began with a scary nun beckoning you in, then a puppet (Christine in Accounting) on a tricycle surrounded by creepy toys asking you to play. Dig deep into a gooey bowl of what feels like eyeballs and get the key from the grim reaper (Dave from IT); proceed down the hall where hands grab you and a masked figure jumps out… only to come face to face with The Butcher herself: Jeanine Davids. Best Decorated Pumpkin (left), Meghan Mclean (Creative & Brand) To create her pumpkin-turned-Dragon, Meghan used QoR Watercolor medium, QoR watercolors, Koi Metallic watercolors, Sculpey, POSCA markers and epoxy to hold it all together. Most Creative Pumpkin (right), Hannah Reineck (Creative & Brand) Hannah adorned her pumpkin with a feather boa and created an avian friend with POSCA markers and glitter. Best Carved Pumpkin (left), Bruce Graham (IT). Bruce went the old fashioned route – all you need is a kitchen knife (and toothpicks to secure the ears)! Most Technical Pumpkin (right), Howard (IT). Howard’s process, and his result, won him the best technical pumpkin: he devised the method of marbling the pumpkin upside down by drilling a hole, sticking a curved paperclip in: voila, beautiful designs covering the entire surface. He used Marabu Easy Marble and a manikin. Did you do anything fun for Halloween with your store? Any staff art or contests? Any Art Dog costumes? Tag us in your posts on Facebook, Twitter or Instagram–we’d love to see. Picture yourself going to your mailbox each day and shuffling through your pile of papers. What do you typically see? Bills, coupons, ads, statements…yawn. Now imagine yourself shuffling through your mail and behold a beautiful, handmade postcard with a personalized message on the back. That’s enough to make your day. Who doesn’t love getting real, handmade mail? Artists can send their art in postcard format with our new Mixed Media Postcards. They’re perfect for the upcoming holiday season. Made with our 400 Series Mixed Media paper, these heavyweight 184 lb (300gsm) postcards have a vellum drawing finish and are sized to handle wet media applications. They’re great for pen and ink, watercolor, gouache, acrylic, graphite, colored pencil, marker and collage. The front of the postcard is left blank for the art. The back is printed with the traditional markings of a postcard so artists can mail their piece and share their art. Available in a standard 4″ x 6″ postcard size with 15 sheets per pad. You may already be familiar with our popular Watercolor Postcards, which have a traditional cold press textured surface and a weight of 140lb (300gsm). These are perfect for watercolorists who want to share their work. For the artists who likes to add details with pens, colored pencils and markers, the new Mixed Media Postcards are the perfect choice. Eight 11 ml tubes of color plus a 37 ml tube of Titanium White make each of these four sets perfect for trying new colors or an entirely new palette from which you can mix a new range of colors. Williamsburg has one of the most extensive selection of oil colors available anywhere, and these sets can help you narrow down options and begin personalizing your palette. Four 8-Color Mixing Sets by Williamsburg Oils from Golden Artist Colors on Vimeo. We recently added two new videos to our Video Library that we think your customers will be interested in. Videos are quick and easy content to share on Facebook and a great way to boost your organic reach. Please visit our YouTube or Vimeo page to check them out! GOLDEN Acrylic Sets : Exploration & Experimentation from Golden Artist Colors on Vimeo. GOLDEN Acrylic Sets are a great way to go from being overwhelmed by the array of colors and mediums available to becoming oriented to the capabilities of different acrylic products. Join Kevin Greeland for a quick look at 16 different sets available now from GOLDEN. “Cody’s hair color change was a BIG surprise to his mom and his brother Zack. They went out of town for a weekend in July and came home to a blue dog with a mohawk. Chris Hauser’s creative genius in action. Needless to say they haven’t gone out of town since. Cody loves people; he is a tail wagger and a licker. He loves his toy Llama and enjoys broccoli for a snack. He is not, however, a fan of car rides and of not being able to lick everyone who comes through the door. Which has disqualified him from being a shop dog. He came to the store regularly for the first year with our family, but gradually transitioned to staying home and lounging on the couch during the day. Mark your calendars! While you’re focusing on sales and promotions for the winter holidays, keep these three retail-related holidays on your radar. We’ve put together key links, hashtags and merchandising ideas so that you can easily integrate Black Friday, Small Business Saturday and Giving Tuesday into your promotions next month. Black Friday is the informal name for the day following Thanksgiving, the fourth Thursday of November. Traditionally recognized as the beginning of the holiday shopping season in the United States, Black Friday is an opportunity to reach a wide audience with deep discounts. While this “holiday” is often utilized by larger nation-wide retailers to have “blow out” sales, in recent years some companies, like REI, have taken a different approach; not participating due to the perception that the focus on shopping takes away from the otherwise family-oriented holiday weekend. To keep your Black Friday sale family friendly, consider holding a small event with a family theme in addition to a sale. Choose a project like rock painting, alcohol ink on yupo, or ornament marbling. Consider having one or two items on closeout pricing. For great deals, check the October SuperMarkdowns list on the Macpherson’s homepage in the Tools drop down menu. Alternatively, be a little cheeky and offer your own version of a Black Friday sale: a sale on all of your black paints, papers, sketchbooks, pens, markers, spray paint, etc. Black Friday is a great day to post on social media—in 2017 more than 130 million people discussed Black Friday on Instagram and Facebook…that’s more than the Superbowl! Announce your holiday hours and any promotions your followers can expect over the coming weeks. Small Business Saturday is a day promoted by American Express and the United States Small Business Administration as part of the Shop Small movement—a nationwide effort to celebrate small businesses and strengthen communities. The “Shop Small Studio” is full of free, easy-to-download promotional materials, ideas for events and tips for effective merchandising. To participate in Small Business Saturday and access these resources, you do not need to be affiliated with American Express. For access to even more planning resources, register your business here and receive promotional goodies such as stickers, balloons and tote bags. Feature locally made products on the day of, as well as store merchandise like t-shirts, mugs or tote bags. Invite local artisans to set up a booth in your store. Host a creative event for children or adults like “Make a Wishlist” where children can walk around the store and write down which items make it on their dream list for the holidays. Utilize the Shop Small Studio to create custom signage. Share your story. Reconnect. Show your community why you love being a part of your neighborhood, and how valuable this season is to your business. Honest communication and a humble thank you will make a meaningful impression, differentiating yourself as a small local business that truly cares. Giving Tuesday is a great opportunity to build relationships with an organization or cause that your customers care about. Register here and download the media toolkit. Click here to see what other retailers have done in the past. #GivingTuesday even has an extremely well thought out social media toolkit with pre-written posts to help you post online. Tag @givingtues in your posts. We are excited to announce a few organizational updates! Please visit our announcements page to read the full letter from our CEO & President, Dave Schofield. John Stephens has transitioned to Director of Marketing, focusing on brand management, category management, creative services and digital experience teams. Neil McIntyre has been promoted to Director of Account Management and he’ll be joining our Senior Leadership Team. He will continue his management of the national field and inside sales teams, in addition to assuming leadership of our customer service team. Jeff Scholz, MacPherson’s Director of IT, will now serve as a member of our Senior Leadership Team. Jessica Krainert, our EDI Specialist, will now serve as our new Integration Manager, overseeing the business and technology integration and onboarding for new customers, vendors and IT projects. This autumn, pump(kin) up your displays and end caps with DecoArt’s Americana Decor Matte Metallics! As a durable, opaque coverage paint, Americana Decor Matte Metallics deliver a chic, subtle sheen that your customers will *fall* in love with for their seasonal DIY decor. Curing to a hard finish, this one-of-a-kind formula offers excellent adhesion to a variety of surfaces such as, wood, glass, and metal. It’s multi-surface capabilities and subtle luster make it the perfect product for year-round use. Gather all 14 traditional and jewel-tone colors to harvest even more creativity in your customers and make your store truly shine! Tip: Feel free to use the projects above and the following informational product video to increase sales and show your customers how simple it can be to DIY your own fall decor with Americana Decor Matte Metallics! *To purchase DecoArt Americana Decor Matte Metallic products, contact your MacPherson’s representative or shop online today! Canson© is excited to introduce the Colorline® portfolio with new colors and formats. Colorline paper from France has dual-sided texture for drawing, colored pencil, pen, marker and mixed media. The brilliant spectrum of colors and weights fit every professional or student, providing an excellent value. We have thirty-two beautiful hues with assortments of 25 colors in 150gsm and heavier stock 300gsm with two sizes 19.5”x25.5” sheets and 8.5”x11” sheets and packs. Our partner brand Daler-Rowney recently discontinued colored art paper Canford in North America due to a mill closure. Customers will be able to purchase Canford while supplies last, we recommend replacing with Colorline as paper craft continues a strong upward trend. Colorline® assortments come with product mix and modular metal display rack with point of purchase header and shelf-strips. The MacPherson’s and Canson teams are ready to support the papercraft trend with 10% off all new full assortment orders. Also, 10% off open stock for our Winter Back to School promotion Nov. 15-Dec. 31st 2018. There is an available reference chart to order Canson colors and order merchandising solution kit, for the winter back to school promotional period through MacPherson’s. Canson pulp-dyed paper means homogenous colors with the ability to erase easily allowing improved finished work. Complies with ISO Standard 9706, acid-free. We at Canson© are determined to carry on the values our company has established throughout the years and throughout the world. See below for a sample of our values. We only choose the finest partners, such as MacPherson’s, so we can share the joy of creating! With over 450 years’ experience, we have unique expertise and know-how. Our goal is to offer all artists high-quality products which inspire them and give them confidence. Contact MacPherson’s for Canson Colorline and a selection of sheets & pads, also explore our other fine art products and partner brands. If you haven’t done so already, be sure to check out the Holiday Set Promotions from GOLDEN. The gift of paint is the perfect holiday present for artists. With this in mind, MacPherson and GOLDEN are offering a 60% discount on these and other select sets for the 2018 Holiday Season. Limited MAP Policy Adjustment (US Only) 40% off September 17 through December 31, 2018. Refer to the MacPherson Buyer’s Guide for further details or see your MacPherson Sales Representative with any questions.